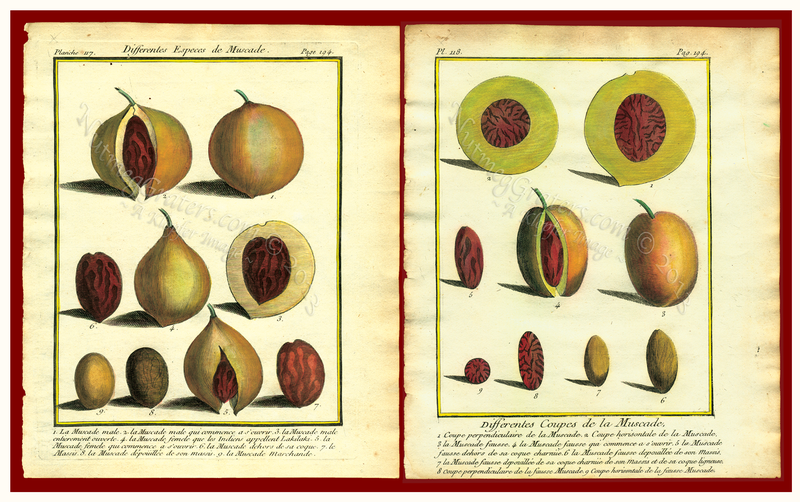 PRINT ENTITLED: "Differentes Especes de Muscade" [Translation: "Different Species of Nutmeg"]. SOURCE: Voyage A La Nouvelle Guinee. PUBLISHED BY: Paris, chez Ruault. by the master botanical illustrator James Sowerby. PLATE PAGE NUMBER: Page 194, Planche 117. East Indies and the Philippine Islands. COLORING:	Later Hand Coloring as described in text. HISTORY: France annexed the Seychelles Islands in the Indian Ocean (1743) and built permanent settlements and spice plantations (1768) before exploration expeditions were launched eastwardly. 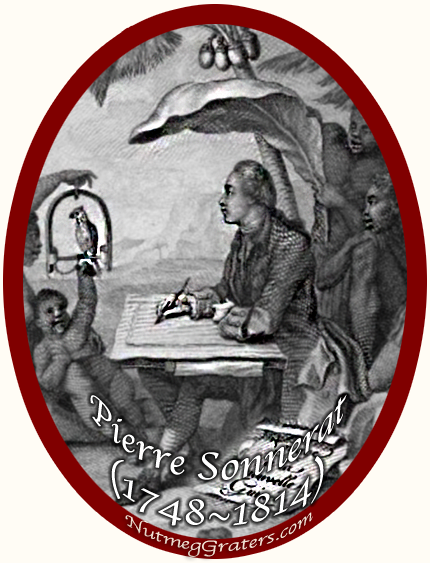 Pierre Sonnerat was the commissioner to the French navy and correspondent of the Cabinet for King Compi with designation to collect important naturalistic observations in Asia and Africa. The first edition of the Voyage a La Nouvelle Guinee by Pierre Sonnerat was published in Paris "Chez Ruault" in 1776. This text is the account of the French expedition (1769 ~ Ca. 1774) which ventured from Ile de France (Mauritius) to New Guinea, the Dutch East Indies and the Philippine Islands. Although the title alludes to New Guinea, it has been reported that Sonnerat never actually landed there, working instead from neighboring islands. It is also known that while returning, the French expedition encountered the Endeavour under the command of Captain James Cook, where Sonnerat exchanged specimens with Joseph Banks, the Endeavour's naturalist. Sonnerat's major research pertains to ornithology (birds) and of the 118 plates in this book, 94 are devoted to Philippino birds. Although most of the text's copper engravings are marked "P. Sonnerat Pinx" (as artist) and "C. Baquey Sculp" (as engraver), the nutmeg prints are not marked. Most interesting is that Sonnerat's godfather was the famous naturalist Pierre Poivre from Mauritius and Seychelles whose 18th century accomplishments, especially his work pertaining to nutmeg, were renown. In later botanical studies, Sonnerat's descriptions of "Muscade" are criticized as inaccurate. Sonnerat was born in Lione Ca. 1745 (or 1749? ) and died in Paris in 1814. REFERENCES: Alexander, W.B. Sonnerat's Voyage to New Guinea, Emu, 23, 1924, p. 299. [BruneV-443].